Goa tops the list when it comes to voters pressing the NOTA button, followed by Uttarakhand. 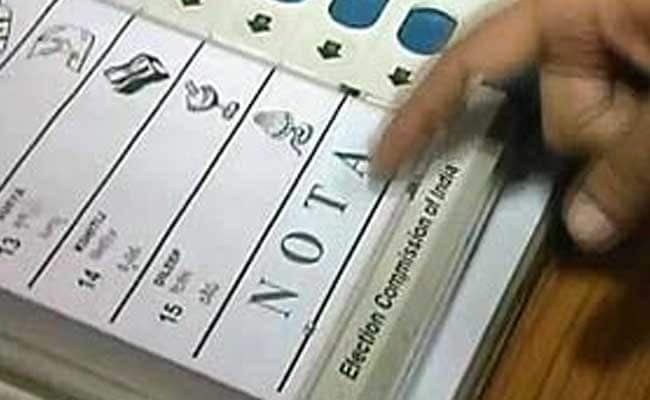 New Delhi: Goa tops the list when it comes to voters pressing the NOTA button in the latest round of assembly polls, closely followed by Uttarakhand. In Goa, 1.2 per cent of the people voted for NOTA (None of the Above), followed by 1 per cent in Uttarakhand, according to data available with the Election Commission of India showed. In Uttar Pradesh, where the BJP was headed for a landslide victory, the percentage of voters who opted for NOTA was 0.9 per cent. The figure stood at 0.7 per cent in Punjab while around 0.5 per cent of the people who exercised their voting right in Manipur chose NOTA. While more than 4,800 candidates were in the fray in UP, Goa saw over 250 contestants. More than 600 people contested in Uttarakhand and over 1,100 in Punjab. Nearly 100 persons stood for the election in Manipur. There are 40 constituencies in Goa, 70 in Uttarakhand, 60 in Manipur, 117 in Punjab and 403 Uttar Pradesh. While the BJP was headed for a stunning victory in Uttar Pradesh and Uttarakhand, the Congress emerged victorious in Punjab. A close contest was seen between the BJP and the Congress in Goa and Manipur.